Havasu Falls is the most well known of the Havasupai waterfalls. 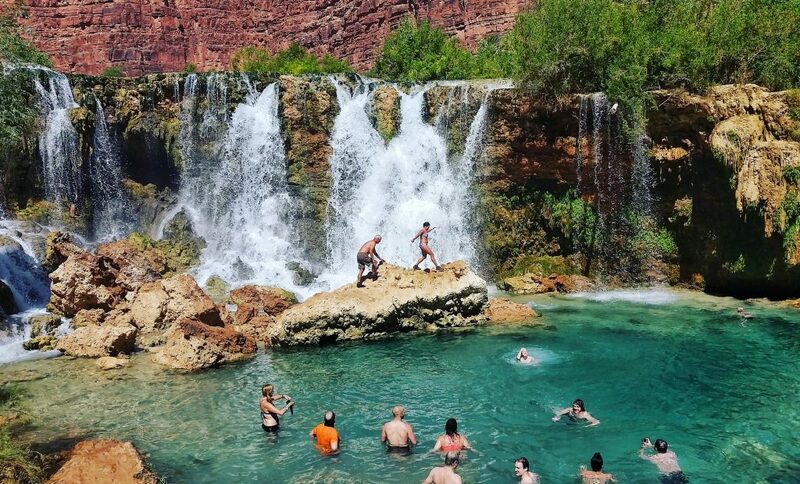 It is 100 feet tall and cascades into a crystal blue-green pool just a 5-minute walk from the Havasupai Campground and about 2 miles from the Village of Supai. Picnic benches dot the dirt-and-rock shore while cottonwood trees shade several smaller waterfalls below the picturesque landmark. Havasu Falls used to be called Bridal Veil Falls in the late 19th century when its flow stretched horizontally across the entire cliff of travertine you see today. Havasu Falls is the visitors’ favorite and most crowded due to its close proximity to the campgrounds and ample space for lounging, sunbathing and swimming. 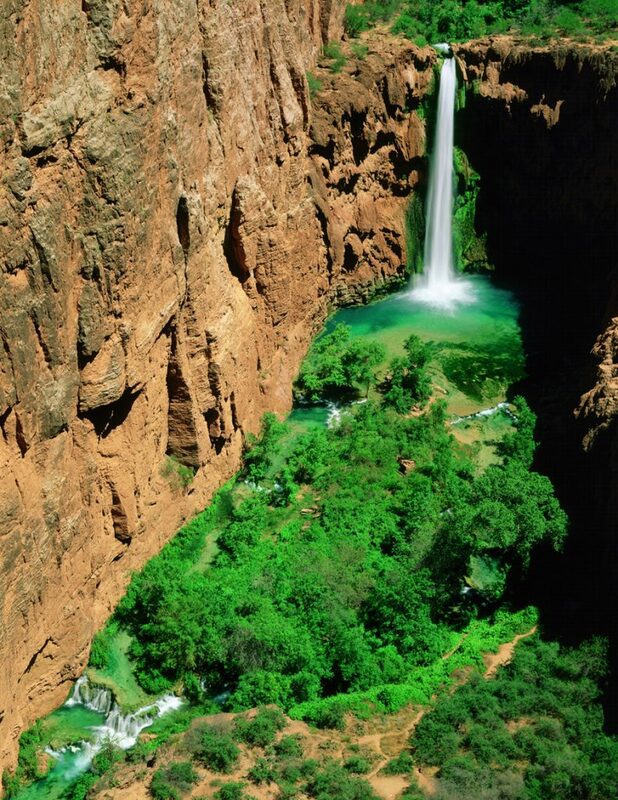 Mooney Falls is the tallest of Havasupai’s waterfalls at just under 200 feet. 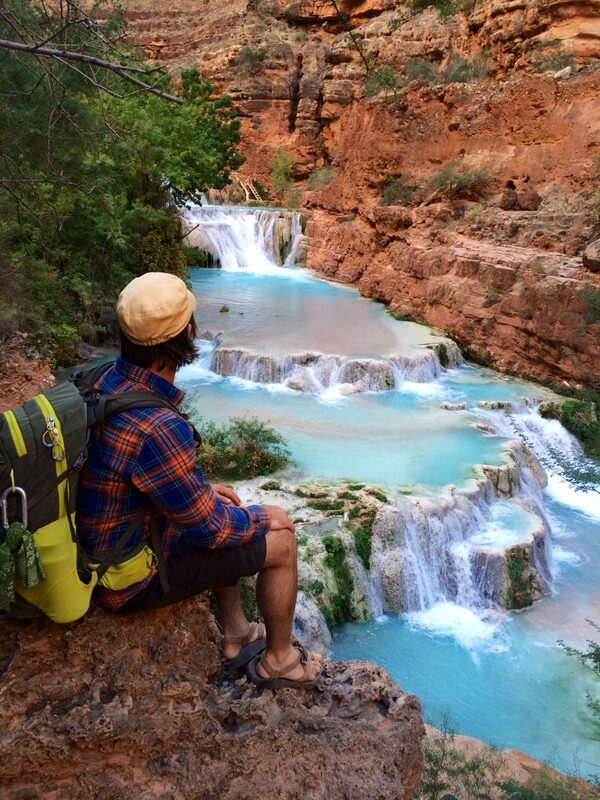 Situated about one mile from Havasu Falls, it marks the end of the Havasupai Campground. The waterfall was named for D.W. “James” Mooney who, in 1882, plummeted to his death over the side of the falls. A former sailor who came to the canyon as part of Alphonso Humphreys’ mining party in 1880, Mooney attempted to descend the falls to discover the riches the party was sure laid within the then-little-traveled lower canyon. At that time this section of the canyon was mostly inaccessible. It wasn’t until Alphonso’s brother, Mat Humphreys, returned in 1883 that the current descent route, involving two tunnels through the travertine and 100 feet of ladder-like rock scrambling, was blasted into the rock surrounding the falls. Descending Mooney is a tourist favorite today, requiring agile adventurers to climb down the same rock face chipped out by Humphreys. Since then the route has been improved by the introduction of pieces of rebar and the occasional chain handrail. Mooney Falls is not safe to swim behind or under as it has a dangerous recirculating current. Beaver Falls is a series of four to five cascading waterfalls, occurring at the confluence of Havasu Canyon and the dry Beaver Canyon, about 3 miles down canyon from the Mooney Falls. It’s a day-trip destination for many Colorado River whitewater rafting trips hiking up from the eddy at River Mile 157. To get to Beaver Falls from the Havasupai Campground, you must do the Mooney Falls descent, then hike 3 more miles down canyon, winding through grapevine fields, avoiding desert bighorn sheep, and crossing Havasu Creek several times. Beaver Falls is known for its gorgeous cascades and large pools, perfect for wading and swimming. During the spring and fall seasons be sure to arrive early in the day if you want to visit while the sun is still shining on the water and surrounding banks. When talking about the “new falls” in Havasu Canyon, people are talking about the waterfalls created during the August 2008 flood. Navajo Falls, now called Old Navajo, was made dry when the water course diverted to the southeast. Now visitors can see 30-foot Rock Falls and New Navajo Falls. These falls are located near each other about 1 mile down from the Village of Supai, or 1 mile up from the Havasupai Campground. Geologically, it is thought that both falls were originally present, then were covered during some large flooding incidents. Their recent unveiling and the drying up of Old Navajo is simply the creek returning to its previous course. Rock Falls is a favorite stop, especially for families, as people can easily swim around the falls and safely climb onto a ledge behind the water flow to a low ledge. Exploring New Navajo and Rock Falls’ various cascades and swimming holes will make you realize you are in Grand Canyon paradise. 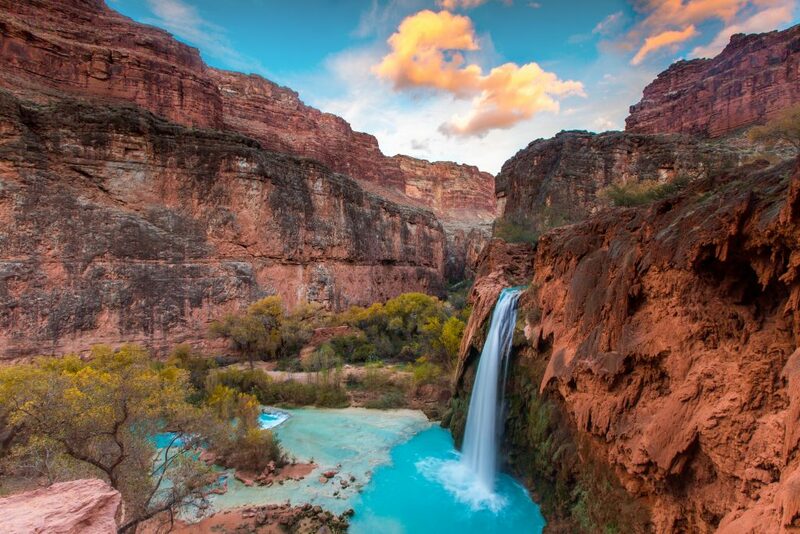 In 2019, AOA is not offering guided trips to Havasupai and Havasu Falls due to a decision by the Havasupai tribe to put a temporary moratorium on commercial permits. However, you can rent all of your gear from AOA and outfit your own self-guided hiking trip! If you have your own permit and just need some help with the planning, book a self-guided Havasu Falls tour and you will be set with all the gear and food you need as well as expert consultation and a complete guide book for where to go and what to see in the canyon. Interested in learning more about AOA’s multi-day guided hiking and camping or guided backpacking trips? Check out our adventure tour calendar or give us a call at 1-866-455-1601. If you don’t see a trip that fits your travel needs, ask about creating your own private or customized trip.